MTM employees: (l.-r.) Gunther, Victor, Tim, Cliff, Tom, Dave and David. Thought to be one of the largest machine tools in the world when commissioned in 1995, this gantry mill at Major Tool & Machine has recently undergone a major rebuild in order to handle even the most complex large parts with speed and high precision utilizing current absolute-technology HEIDENHAIN linear scales. 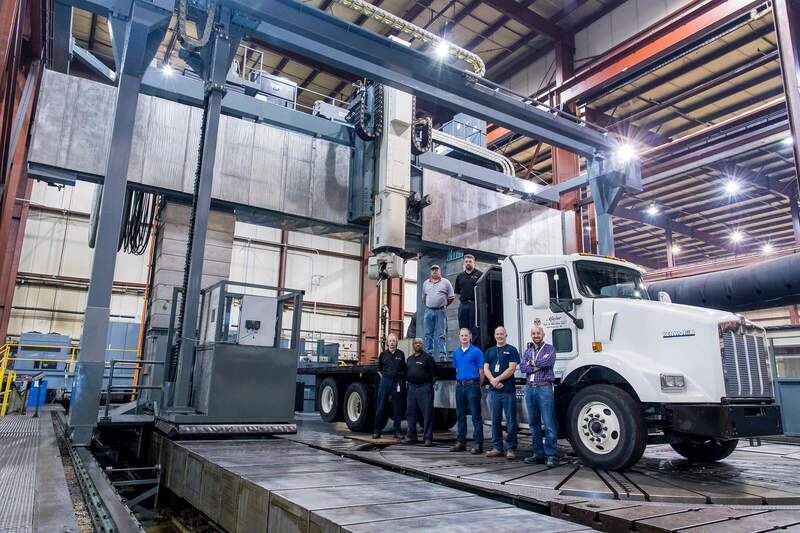 Change is not easy when unusually massive size is involved, but that was the challenge in 2010 when it came time to discuss updating the super-large gantry mill at Major Tool & Machine (MTM) in Indiana to meet the needs of today’s customers. Originally commissioned in Germany soon after the Berlin Wall fell, this SCHIESS FZG6 (DSI) mill was thought to be one of the largest in the world. MTM executives even built a separate building for it in Indianapolis, and it was put into service in 1996. At the time of commissioning, Gunther Zimmermann was hired by MTM and came from Germany to oversee the project. Having established roots in Indiana, Gunther became a U.S. citizen and remains an important employee at MTM. “We have many significant machine tools here, but this is a very unique machine and our largest,” MTM CNC Controls Engineer Zimmermann explains. “Its bed goes 40 feet into the ground, its workspace is huge, and it has both 5-axis milling and turning capabilities. Handling the machining of large parts for many years, it has proven to be a true work horse.” MTM manufactures hardware for a variety of industries including aerospace, power generation, commercial industrial, and the nuclear power markets. “But technical developments have come a long way in over 20 years,” expressed Zimmerman. 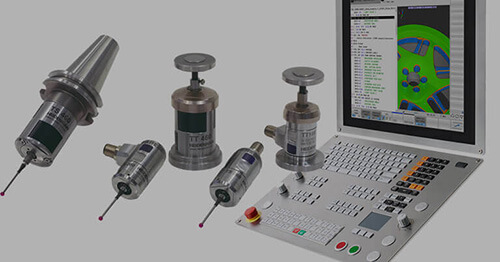 So in 2014, the SCHIESS (DSI) machine rebuild began and included complete retrofitting of the electrical system, new CNC control/drive systems, and new position feedback with HEIDENHAIN absolute linear scales. “Absolute technology in super long scales was not even available a few short years ago!” explained Zimmerman. After more than 2 years of work, the 1990s SCHIESS (DSI) gantry mill is now working with all the agility and precision that 2017 has to offer. 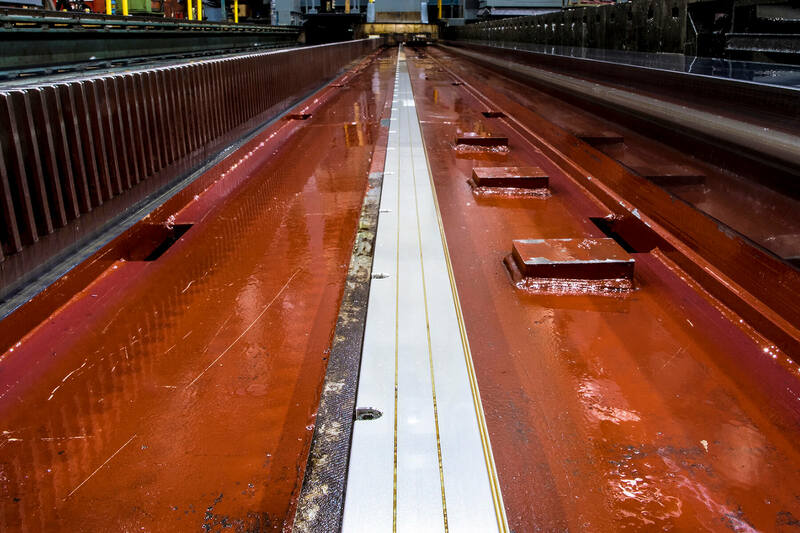 The major steps of the SCHIESS (DSI) retrofit started in late 2014 with contracting FIVES Cincinnati to overhaul the electrical system and the CNC control and drive. It then moved to the removal of the ram, which was replaced with a FIVES Cincinnati design who was instrumental in the rebuild. With that came a built-in spindle motor and C-axis; including all the newest developments in drive technology, explained Zimmermann. 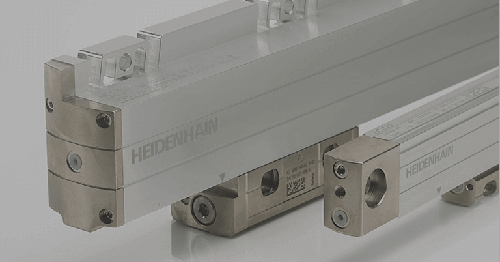 HEIDENHAIN’s longest linear scale installed in North America to date. Then staff replaced the existing milling heads/adapters with five new ones, plus one for turning mode. 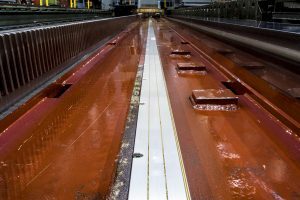 In the middle of all this, they re-levelled the machine and re-adjusted all the geometries, resulting in the next step of putting new feedback on the machine, in this case, new HEIDENHAIN linear scales on six master axes to provide it with the latest advances in measurement feedback technology. All connect to the new control system, including the non-machining axes, the total number of configured axes and spindles is 20. The SCHIESS (DSI) machine master axes travels are extraordinarily long with the two X axes at 740” each, the Y axis is 377”, the Z axis is 98” and the two W at 115”. 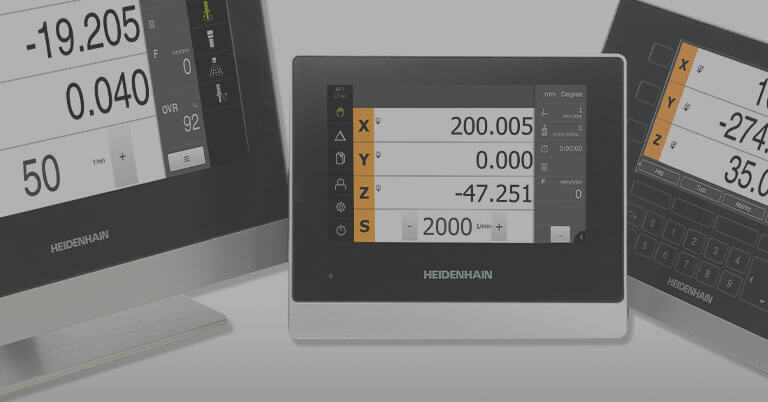 Zimmermann explained that the original mill already had HEIDENHAIN LB linear scales on the machine, but the new HEIDENHAIN LC 201 absolute linear scales offered major improvements and new features. 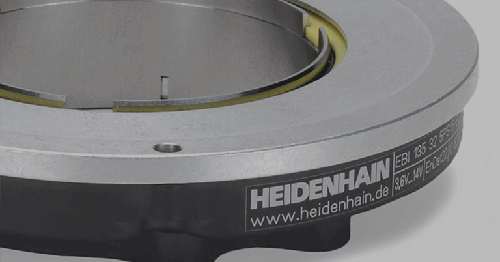 “The HEIDENHAIN encoders get better every year,” added Zimmermann. “The entire rebuild process took about two years, with partial use of the machine during various stages,” explained Zimmermann who said a time-lapse camera was set up to film the course of the rebuild. The rotary table on this rebuilt machine is six meters in diameter, and is capable of contouring together with all other machine axes, providing positioning accuracy of less than 10 arc sec. Four different milling heads up to 100 hp (75 kW) and maximum spindle speeds up to 2800 RPM are in place. 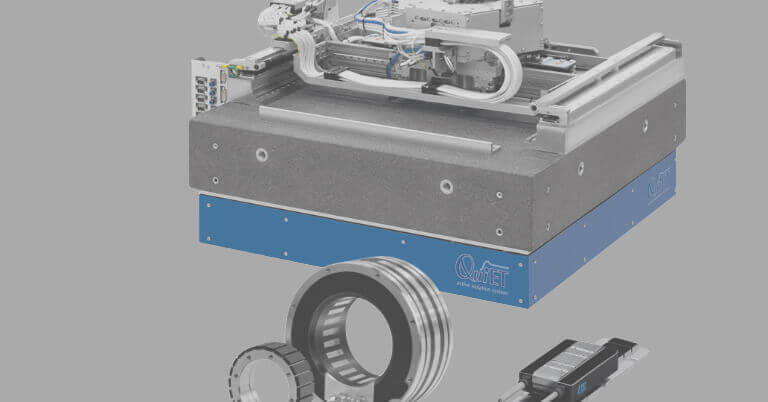 It also has turning capabilities, and using a turning head with CAPTO tool holders; the table in this mode can run up to 60 rpm and has a part weight capacity of 125 metric tons (280,000 lbs.). 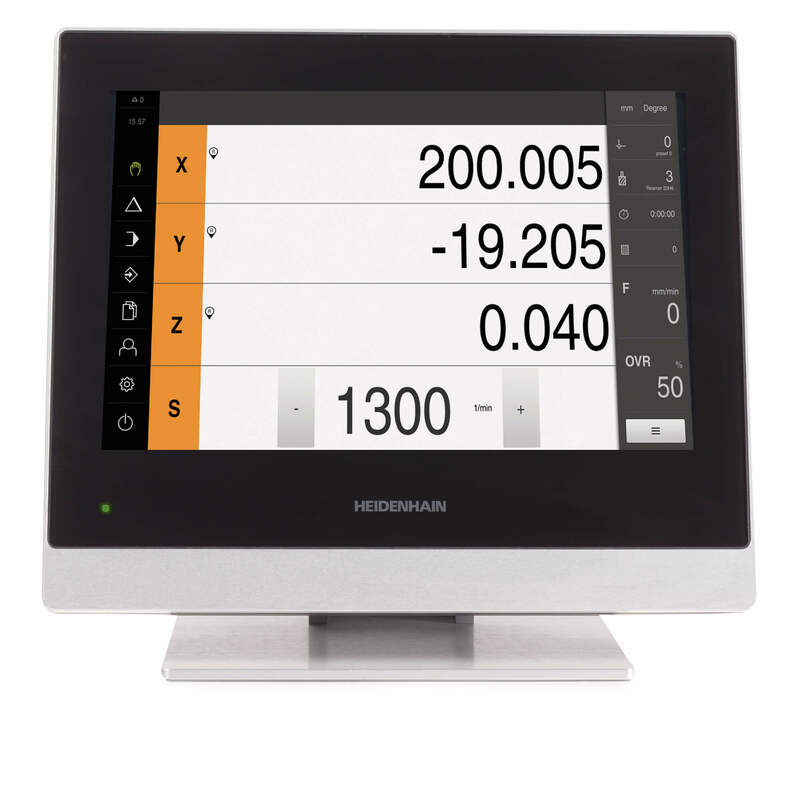 To make it happen, HEIDENHAIN provided the new very long linear scales: two at 3,640 mm (one standard and one mirrored), one at 10,440 mm across the head and the two granddaddies at 21,040 mm each, the longest HEIDENHAIN absolute scales to be sold to date in the U.S. “This is HUGE! The largest I’ve seen in my 17 years here,” exclaimed Binder whose staff handled the installation. The decision to use the HEIDENHAIN LC 201 absolute linear scales has been a success. “They have been working great,” added Zimmermann who explains that the machine went into full power working mode in October 2016. 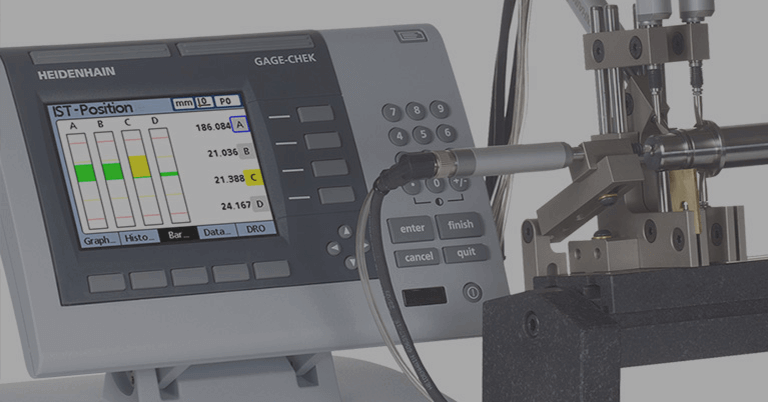 He also explains that the main machining axes continue to maintain their accuracy targets, in fact staying below them, as the scale’s positioning accuracies are achieved in conjunction with laser equipment and CEC compensation in the control (see chart below for master axes specs). Total travel is 20.0 Meters or 787"
Total travel on Y is 9.6 Meters or 377"
Total travel on Y is 2.5 Meters or 98.5"
Total travel on W is 3.0 Meters or 118"